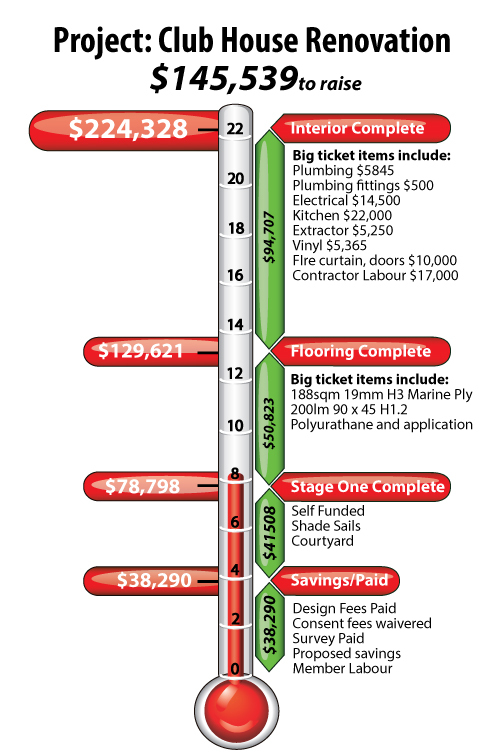 Whiritoa SLSC is always fundraising for various areas of the club. Below are some ways you can help. By breaking these out into graphic and text format we think it will better communicate the progress and illustrate the short falls or opportunities for members to get involved, help out and donate to the cause. In this issue we look at progress and where we are heading with the three projects, announce some new fundraising initiatives gleaned from a recent committee think tank and look at the Fundraising Events Calendar for the 2014/15 Summer season. As always we welcome your comments and feedback. Enjoy! Earlier in the year a decision by the committee was made to upgrade the current ATV while we could still get a reasonable resale value for our current trusty Polaris. Extensive tests and trials were carried out on almost all competing brands of ATV and the winner was the Yamaha Viking. With a reduced price tag of $18.500, the process of fundraising has begun. We are not going to list the Polaris for sale until we have secured the necessary funds to cover the upgrade. 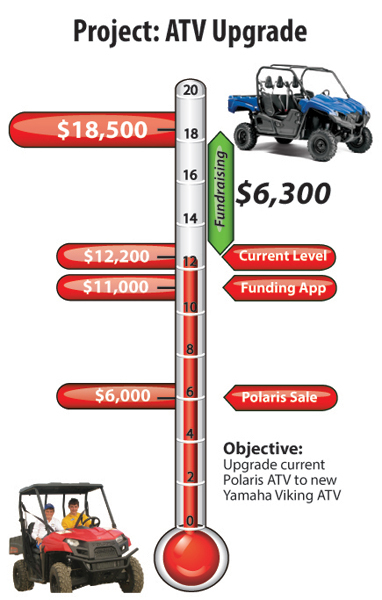 We will sell the polaris to a club supporter for $6000. We have received a VERY generous donation from the Polglase Family of $1,200 and the committee, on behalf of the whole club, would like to say a big THANK YOU to them for there incredibly generous contribution to this project. This leaves a total of $6,300 outstanding to be sourced. We are well on our way to achieving our goal! This is our major project and has been the focus of the committee for a number of years now. Stage one is now complete with the addition of a new private court yard area of the life guard living quarters and the shade sails put up in the front of the club. This has netted out to a largely self funded investment of just under $80k. This has also covered the hidden costs of design, resource and building consents, and surveys, which cover the whole project. The next major step in the project is to replace the floor. The big ticket items here are the materials. We need 188sqm of 19mm H3 treated marine ply. Specifically we need 37 1.2*2.4 sheets and 27 1.2*2.7 sheets for the floor surface. We also need 200lm of 90×45, H1.2 treated timber to be cut to 400mm lengths to go between floor joists where the ply sheets meet to protect those joins and stop movement. Once this has been secured we will be running a series of working bees at the club to lay it. We need workers and of course, we also require a qualified tradie to over see the work. The flooring is an area we would like to upgrade initially, with soft patches all over the place. We would like to see this phase of the project completed before the up coming summer season. We all know how tired the clubs furniture situation is. While this project is fairly low priority we have started planning this. Local property owner Sally Tye has come on board to assist with this. At a recent brain storming session ideas around furniture styles, indoor out door flow, cost effectiveness and durability and a pizza oven were batted around with Sally and she is currently working on concepts for us to consider. Sally will spear head the project once we have worked through the best way forward. Who’s got some lazy Flybuys™ Points lying around? The idea is you pledge some Flybuys™ by emailing us with how many you would like to donate. Once we have enough we go shopping on the Flybuys™ website and come up with 3 major prize packs. We will then come back to you and ask you to go to the Flybuys™ website, purchase specific items and have them shipped to us. We then sell raffle tickets for the prize packs. A heads up for a save the date, Saturday, 6 December 2014 is the first day of patrol at Whiritoa this year, its been a bleak winter and I for one am hanging out for summer. So much so we think it would be a good idea to welcome the summer with a celebration and fundraiser. We are currently working through the details with event potential sponsors – without letting the ‘cat out of the bag’ some hints of what’s to come are: craft beer, live music, hot food. Fantastic work..great reading and inspiration…look forward to the progress and helping out to become one of the best surf club in the land !!! Sent through some fundraising ideas to Michael and also set up an auto payment for the new ATV! few dollars a day each and we will get there in no time! Nice Chaz, and very generous too.